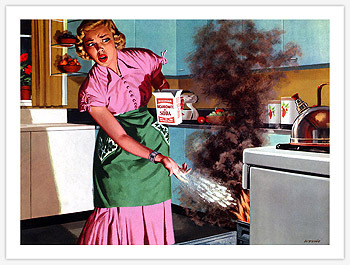 This 1956 illustrati0n is just the thing to perk up a non- percolating, retro-deficient kitchen. 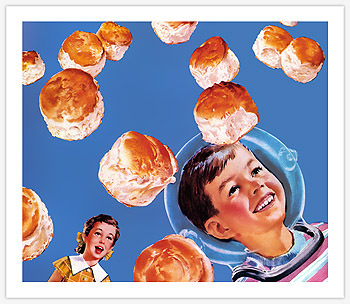 Click here to order, or just to inhale a dose of biscuity, flaky goodness. Remember glass bottles? Bottlecaps? Paper straws? This wonderful illustration from 1955 will never go flat. Click here to order. 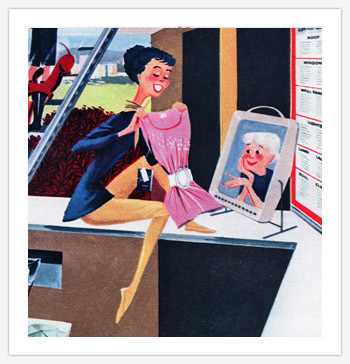 Sometime soon -- 1958 or '59 at the latest -- we'll have TVs you can hang on the wall like a picture. Click here to order. 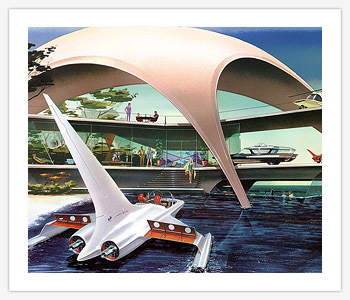 A vacation home for the Atomic Age, circa 1957. Or is it 2057? Click here to order. Breakfast in New York, cocktails on Uranus? 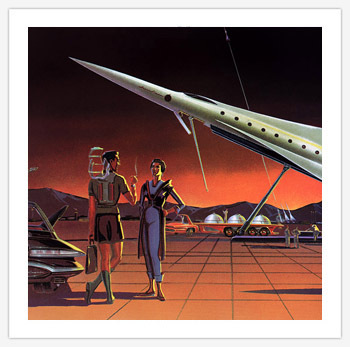 It's all possible in the wonderful world of the retro-future. Click here to order. 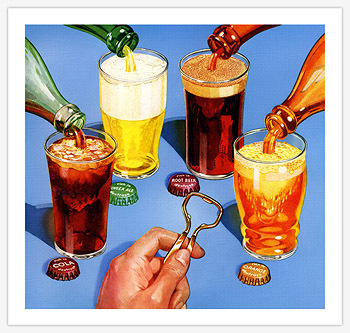 Carbonation, artificial flavoring and high-fructose corn syrup never looked so good as in this hyper-colorful graphic from 1946. 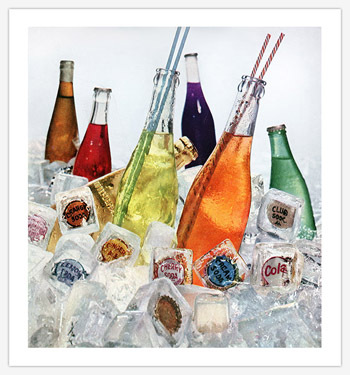 Click here to order, or just to let the bubbles tickle your nose. A favorite of your Web- master, who spent many hours restoring and reconstructing this image to its original high-resolution glory. Click to order. 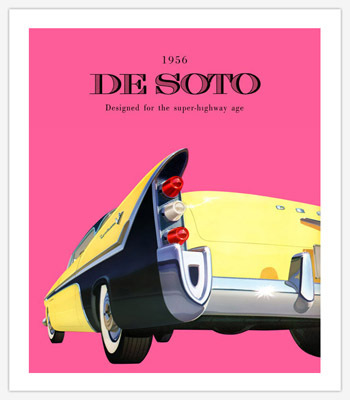 Yellow, black and bubblegum pink are the color notes in this illustration from the cover of the 1956 DeSoto sales catalog. 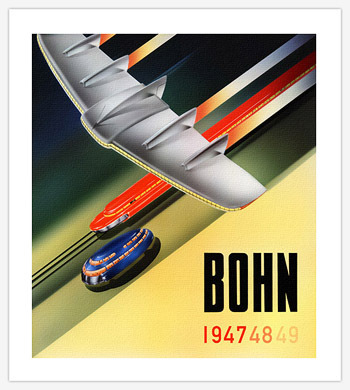 Recomposited at ultra-high resolution, it makes a razor-sharp print even at the largest sizes. 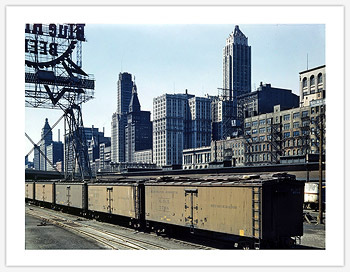 Railroad and historical photos are the specialty at Juniper Gallery Fine Art Prints, an offshoot of Plan59. Click here to enter. 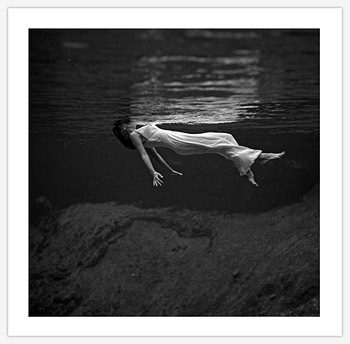 The lady in the lake from 1947, one of the most popular Juniper Gallery prints,	can be found here. 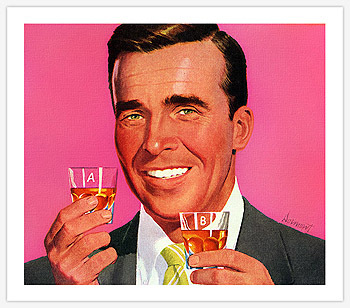 This 1953 illustration by Philip Dormont for Calvert Whiskey is a cheerful invitation to lift a glass of A, or possibly B. Let it lively up your next get-together. Freddy here is just one in our inexplicably popular cabal of	Demonic Tots. You'll swear his eyes are following you! Dare to order this print. 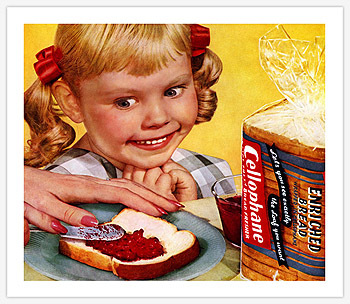 We're sending the kids to college on sales of the Ravenous Girl. Won't you help? Click here to order. And watch your fingers. 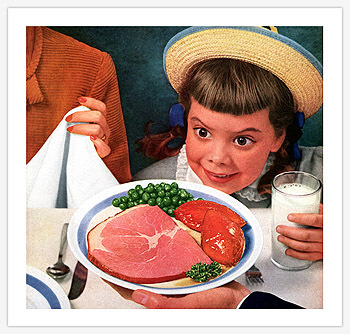 A loaf of bread, a glass of milk, and ham and peas and yams with a sprig of parsley, and thou: The perfect combination! Click to order. 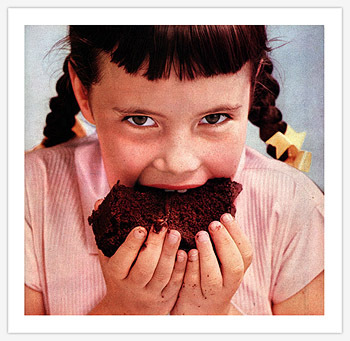 Walk into the room with a chocolate layer cake and her beady, greedy eyes seem to follow you! Click if you dare. 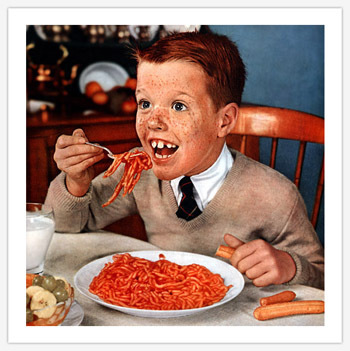 Since 1954 little Sparky here has been sitting at the table, mouth open, petrified spaghetti poised to enter his gaping maw. Share the magic. 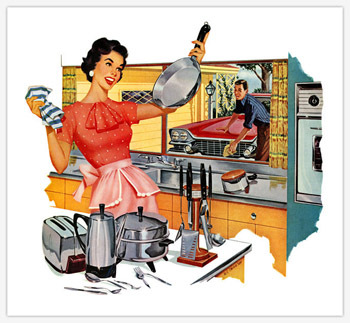 From 1960, a classic vision of obsessive-compulsive domestic bliss. Guaranteed to add sparkle to any kitchen or conversation. Click to order. 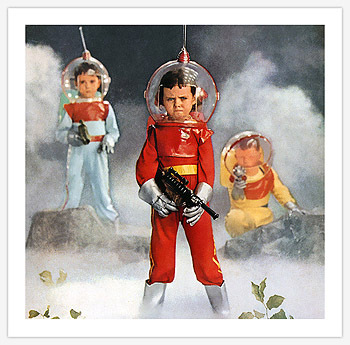 They came from 1958, and invaded dozens of homes across the planet. Don't our colorful cadets deserve a place in your inner space? Beam them down now. 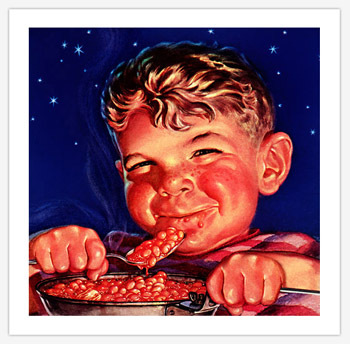 Yet another of our devilishly appealing bean-eating tots. Click here and he's yours. Napkins not included. From 1951 and the Kitchen of the Ancients comes "Offering to the Oven-God," a ritual that involved the sacrifice of a cow in a loaf pan and box of baking soda. Click to order. 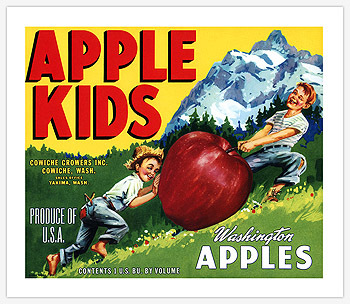 Made from our extensive collection of original fruit crate labels, most using eight- color lithography. Seem them all at	BoxOfApples.com. 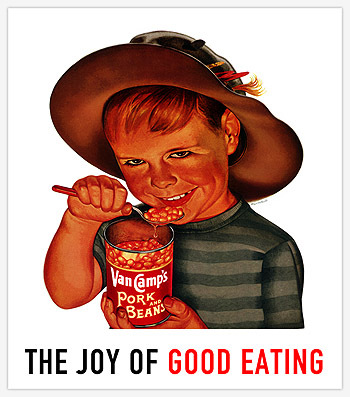 From 1946 comes this colorful, cheery, grisly poster for the American Meat Institute. Click to order. 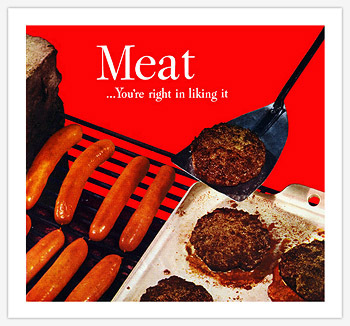 Worried you might be eating too much MEAT? Silly you. Everyone knows MEAT is nature's perfect food. 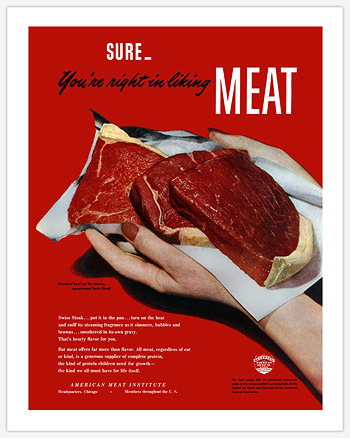 Quell those lingering MEAT-doubts with this terrifying illustration from the American MEAT Insitute. Click here to order. 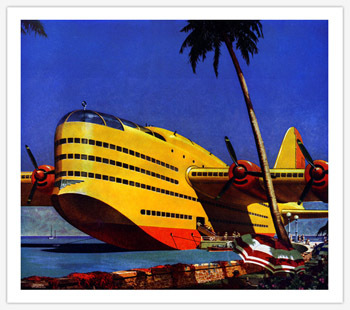 This colorful 1946 illustration, probably the most popular print offered by Plan59, takes off daily. Add yourself to the flight plan. 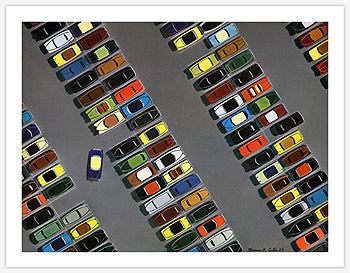 If Mondrian painted parking lots, we imagine they might look something like this 1953 illustration. Click to order. 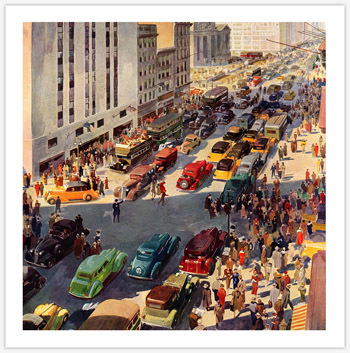 The New York Public Library is at the top of this 1936 watercolor. It reproduces beautifully even at the largest sizes. Click to order. 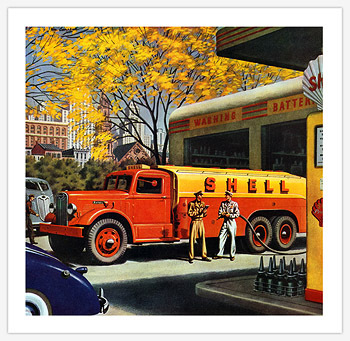 Of the many outstanding illustrations painted in the 1940s by William Campbell for Autocar Trucks, we like this one best of all. Very popular with boys of all ages. Click here to order. 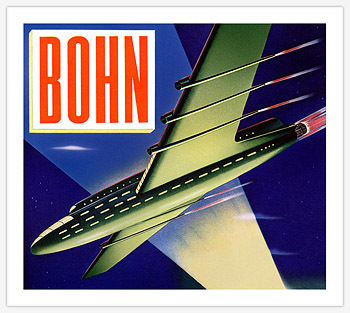 Bohn Flight 1 took off in 1944. Will it land on your walls in 2007? Click to order. 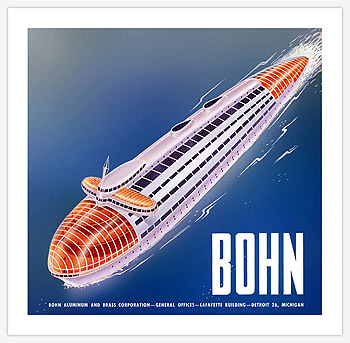 Another of Bohn Aluminum's retro-futuristic conveyances of tomorrow. Click to order. 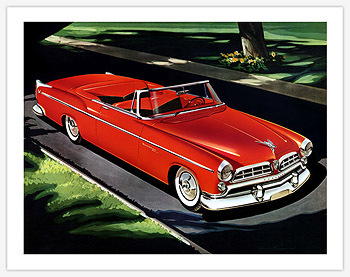 This pop-art confection from a 1956 car brochure can be found in corner offices across the land. Make it yours. 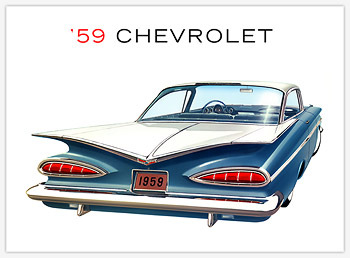 Have you ever seen a more tasteful set of tailfins? Park them in your space today. 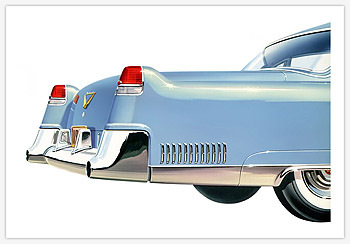 Pointed yet voluptuous was Cadillac for 1957. 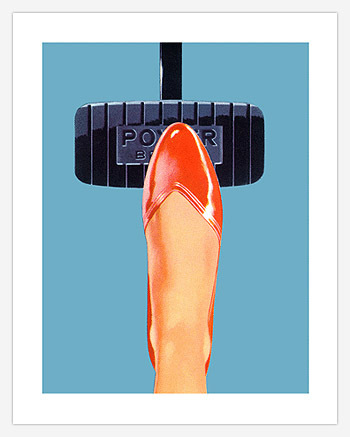 Probably our most popular car print. Click here to order. 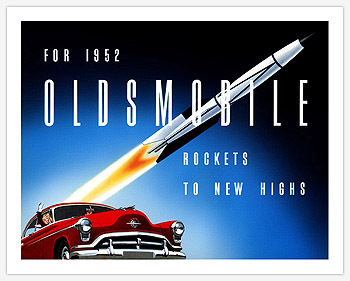 A convertible that converted into a space rocket, the 58 Caddy was where Harley Earl met Buck Rogers. Click here. 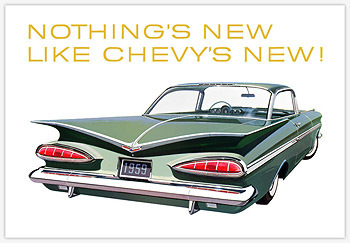 "All New All Over Again" was the slogan for the batwinged 1959 Chevy. Click to order. 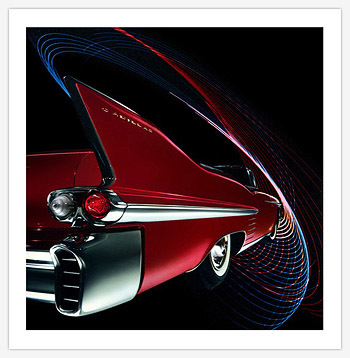 The iconic 1950s car, suitable for framing if not driving. Click here to order. Even stopped, this two-toned 59 Chevy makes a statement. Make it yours. 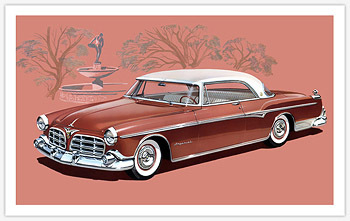 A tomato-red 1955 Chrysler convertible is just the thing for your driveway, or hallway. Click to order. 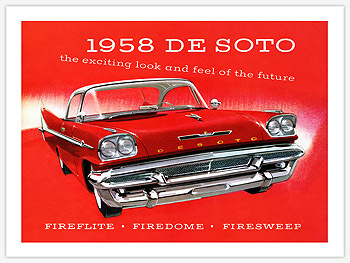 Delightful, delovely and sadly defunct, the 1958 DeSoto lives on in this eye-popping illustration from the cover of the sales catalog. Click here. 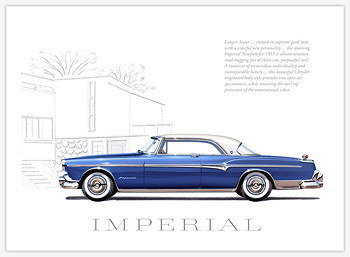 This impressive illustration from the 1955 Imperial prestige brochure includes a block of text subtly printed in gray. Click here to order. 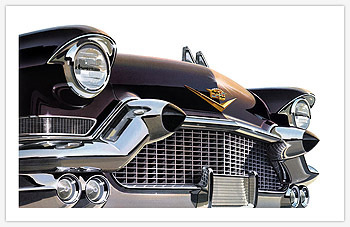 This 1955 Imperial Newport looks good enough to eat. Click to place your order. What's big and red and full of girls? The Futuramic 1949 Oldsmobile station wagon. Click here to hop in. 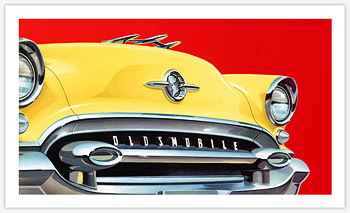 One of our most popular Oldsmobile prints comes from the cover of the sales brochure. Click to order. 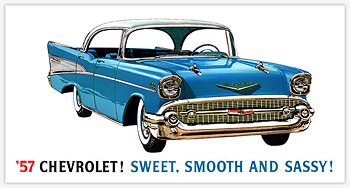 Watch their faces light up a buttery shade of yellow when they see the sofa-size 1955 Olds you've just given them! Set the wheels in motion. 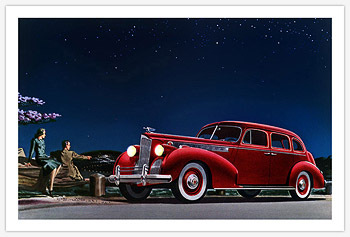 My love is like a red, red Packard. 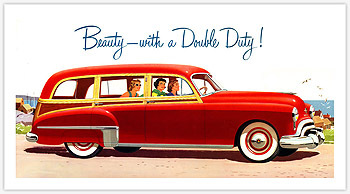 A 1940 Super-8 One-Sixty Touring Sedan, to be specific. Click to order. 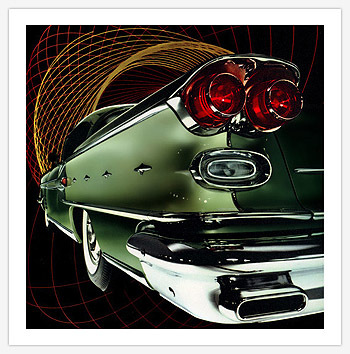 The Pontiac Bonneville for 1958 had a rocket motif on the sides spitting out stylized chrome flames. Perfect for garage or living room. 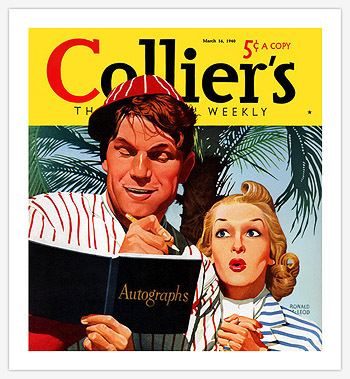 A baseball-themed magazine cover from 1940 by Ronald McLeod. Slide it into home.